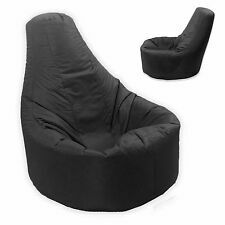 The designer recliner is only available atBean Bag Bazaar is u niquely engineered 6 panel design creates superior comfort for long periods and finished with two rows of stitching for ultimate strength and design style. 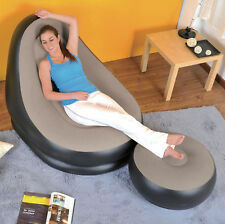 This inflatable lounger is a lightweight item and presents no trouble to move from room to room. The lounger is quickly deflated for longer distances and convenient storage. -Contoured seat with comfortable backrest and footstool. 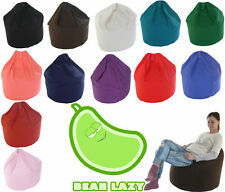 This Kids Classic Faux Fur Bean Bag by Icon ® is only available atBean Bag Bazaar. This large faux fur bean bag is perfect for kids to sink into and stay cosy and warm. If you think the kids will be competing over this luxury bean bag then why not get an extra one as a treat?. 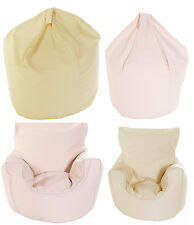 ZIPPY WATERPROOF BEANBAG CUSHION. FOR PALLET & RATTAN FURNITURE. CAN ALSO BE USED FOR RATTAN & CANE FURNITURE. POLYESTER FABRIC WITH A WATERPROOF BACKING. CHOOSE FROM 18 PLAIN COLOURS. TO VIEW THE FULL RANGE. The Deluxe Lounge Chair With Ottoman Is A Perfect Choice For Relaxation In Transitional Spaces Inflatable loungers are lightweight and present no trouble to move from room to room. They are quickly deflated for longer distances and convenient storage. Buy one or more for convenient seating solutions when family visits for the holidays, or give your favorite college student the gift of comfort in their home away from home! Features: Nice comfortable Chair with Ottoman, which can be also be used as a seat by a partner, or even as a side table to stack so books or papers. Dimension of Lounger: 49x39x33.5" (125x100x85 cm) approx. Dimension of Ottoman Stool (63x63x29cm) approx. Deluxe inflatable furniture for dormitory and home use. Contoured seat with comfortable backrest and a footstool. 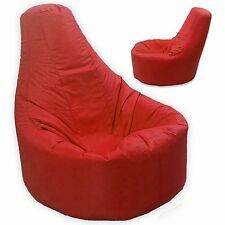 INTEX FLOCKED EMPIRE INFLATABLE CHAIR. waterproof flocked top and sides with 20 gauge (0.50mm) laminated bottom. best describes the Empire inflatable chair. this chair is the perfect combination of form and function. The i-eX JR, only available atBean Bag Bazaar, is the ultimate gaming chair for kids and teenagers. This kids gaming chair is bean-filled for ultimate comfort and support. The unique panels and stitching provide back and neck support and supports your natural gaming position whilst being lightweight and easily maneuverable. Shark "Bijou" Crushed Velvet Highback Bean Bag. Our "Bijou" Crushed Velvet bean bag is the perfect designer accessory for your room. Extra soft, plush and luxurious crushed velvet fabric makes this the perfect bean bag to relax in.